Joseph Wayne-patrick P., thank you for your kind review; we are happy to pass along your comments to the team here at Regal Parc! If you ever need anything else from us, please feel free to give us a call or stop by. Have an awesome day! Rachel Marie T., thank you so much for your high rating! If you ever need anything else from us, please feel free to give us a call or stop by. Have an awesome day! Apartments themselves aren’t bad but neighbors aren’t the best. Banging around at all hours of the night and a lot of time cops come looking for people. Lauren Ashley E., we regret to hear that you had a negative experience with us, but would appreciate the chance to turn your experience around.We would like to work towards a resolution, so if you are willing, please reach out to us at (512) 249-0490 to discuss this further. Love it here, honestly a very wonderful community. Everyone is super kind and very welcoming. Glad we chose this apartment complex! Highly recommended. Hi Kyli P., thank you for taking the time to leave a review for us at Regal Parc. We're happy we could meet your expectations! We hope to see you soon! John S L., your wonderful feedback and rating mean a lot to us. If you ever need anything else from us, please feel free to give us a call or stop by. Have an awesome day! My only complaint is the parking situation. And that the garages all cost the same yet do not have the same ammount if space. We had a 2 car garage and switched garages not knowing that the one we were going into was smaller and still had to pay the same even though we could no longer fit both cars in the garage. Otherwise our experience has been rather pleasant. Brandon H., thank you so much for your high rating! If you ever need anything else from us, please feel free to give us a call or stop by. Have an awesome day! We've nothing but good things to say about the staff, we have had some parking related issues (hard to dind available spaces at certain times!). Also had a misleading garage situation happen that was very off putting. Other than that, this side of the complex is nice and aesthetically pleasing. We do suggest that there should be doggy stations (doodoo bags) installed since we do run into a lot of pet droppings! We appreciate all reviews, and appreciate you giving us the chance to improve by providing us with this feedback. If you ever need anything else from us, please feel free to give us a call or stop by. Have an awesome day! Karen W., we regret to hear that you had a negative experience with us, but would appreciate the chance to turn your experience around. We would like to work towards a resolution, so if you are willing, please reach out to us at (512) 249-0490 to discuss this further. Juan Ramos C., we really appreciate your feedback! If you ever need anything else from us, please feel free to give us a call or stop by. Have an awesome day! I love our apartment because of how new it is but it is not in the best environment. The pool is never actually cleaned so we have never been able to use it since moving here. The gym is small (which is fine) but it i often EXTREMELY dirty and often smells like weed since boys who live in apartments on the facility will smoke in there. The office says they will get back to us when we ask about resigning, but they never did so we chose not to. Because there are older apartments in the front I feel like they attract a different crowd that I no longer feel comfortable with. Hi Kennedy C., we regret to hear that you are displeased with your recent experience with us.Thank you for sharing your concern. Our residents come first to us, so we would like to resolve this situation to the best of our abilities. In order to address your specific needs, please contact us at (512)249-0490. We look forward to speaking to you soon. I love the location is perfect,convenient to everything. The fitness center is perfect I use it often. The staff is friendly and helpful. Maintanence fixes issues quickly..
Beth Ann S., your wonderful feedback and rating mean a lot to us. We are always more than happy to assist you if anything else comes up. Take care! I love the location it's convenient to everything. The fitness center is perfect I go there often. The staff is friendly and helpful. And maintenance takes care of issues quickly..
Hi Beth*@*.com, thank you so much for your positive comments about Regal Parc! If you ever need anything else from us, please feel free to give us a call or stop by. Have an awesome day! We live in the one bedroom, one bath apartment. We love it and plan to renew for another year as well. It has been a great place to live so far, and hope next year is the same experience. Sean Patrick S., we strive for 100% satisfaction, and it is great to see you had such a positive experience at Regal Parc. If you ever need anything else from us, please feel free to give us a call or stop by. Have an awesome day! The new apartments are good and spacious. I have had no complaints regarding the apartment itself other than a leak in the sink that can happen with anyone. The only qualms I have are the lack of convenient parking spots and that there are no reserved parking spots near the buildings 9-13 (phase II) area. I also do not particularly like the trash picking agency that writes you notes for little things like closing your bags, etc. but does not come on time ever. Hello Sumay B., we appreciate you taking the time to leave us this feedback. Feel free to reach out to us if you need anything. Have a wonderful day. I drove around the residence and it is pretty quiet and peaceful. The location for me is ideal. Close enough for family and close to my daughters as well! The staff was extremely helpful and responsive. Jorge V., we are very happy we could provide you with a positive experience! If you have any further questions, please give us a call. We're always happy to help! We appreciate all reviews, and appreciate you giving us the chance to improve by providing us with this feedback. We would like to have a better understanding about your experience. Please reach out to us at (512) 249-0490 at your earliest convenience and we will do our best to resolve this with you. Love living here! Good environment & staff. The Maintenance team is super nice & helpful. Haven’t really had any problems since moving in & we have been here for 4 months. Charlotte Leigh G., we're happy you found our staff to be so supportive during your experience here at Regal Parc. If you ever need anything else from us, please feel free to give us a call or stop by. Have an awesome day! Not enough play places for kids. Not sufficient dog park space and no pet waste disposal stations. New units are nice and modern. Schools are great. Michael G., thank you for the high star rating! Please let us know if there is anything else we can do for you; we are more than happy to help! The complex itself is nice, maintenance completes your work order rather quickly, and billing is simple. The floorboards are thin though. You can hear the upstairs neighbors walking throughout the day. Alexander Rojelio R., thank you for your kind review; we are happy to pass along your comments to the team here at Regal Parc! We are always more than happy to assist you if anything else comes up. Take care! I hate being late paying my rent bit I'm so happy that yall are willing to work with us and understand. I also love the trash service & glad we finally have speed bumps but I think another one needs to be added around building 4. 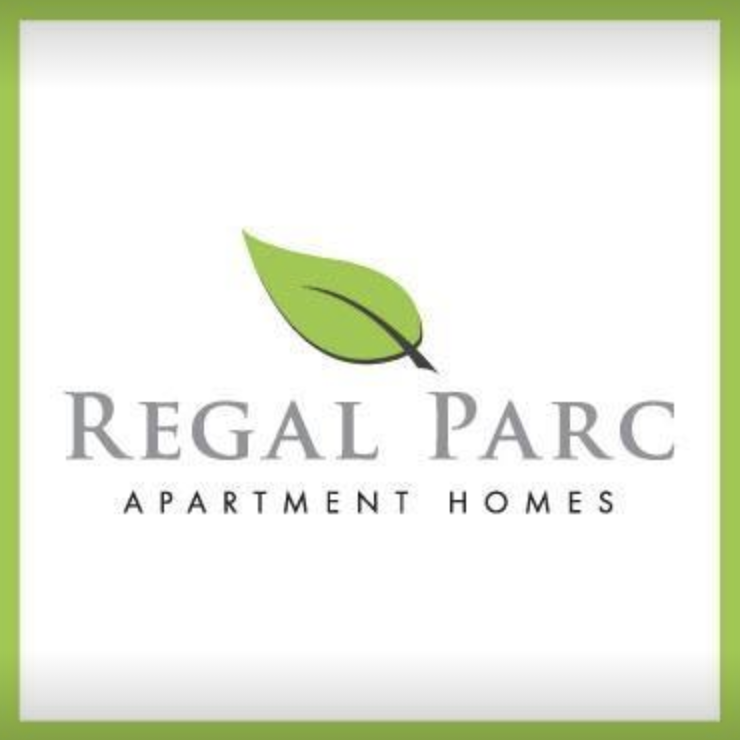 Hi Jeffery Scott J., thank you so much for your positive comments about Regal Parc! We are always more than happy to assist you if anything else comes up. Take care! Just signed my lease, and I move in early March couldn’t be more thrilled! Marie Dillard at the front office has made this such a hassle free process! I look forward to what’s to come! Blake M., thank you for your kind review; we are happy to pass along your comments to the team here at Regal Parc! If you ever need anything else from us, please feel free to give us a call or stop by. Have an awesome day! Sima M., thanks for your praise and kind comments about our team. Please don't hesitate to reach out if there's anything additional we can do for you. The best place we could have chosen to live! We have been extremely satisfied with our apartment, the management, amenities, office staff, and maintenance staff. The leasing office staff have been accommodating, understanding, and on top of anything that we have asked of them. I would highly recommend this community without hesitation! Hi Rajiv M., thank you so much for your positive comments about Regal Parc! If you ever need anything else from us, please feel free to give us a call or stop by. Have an awesome day! The staff is super welcoming & friendly. And the maintenance is super fast. I love having the convenience of working out at the gym here as well! Over all love living here! Karina F., we're happy you found our staff to be so supportive during your experience here at Regal Parc. We can't wait to see you again, have a great day.